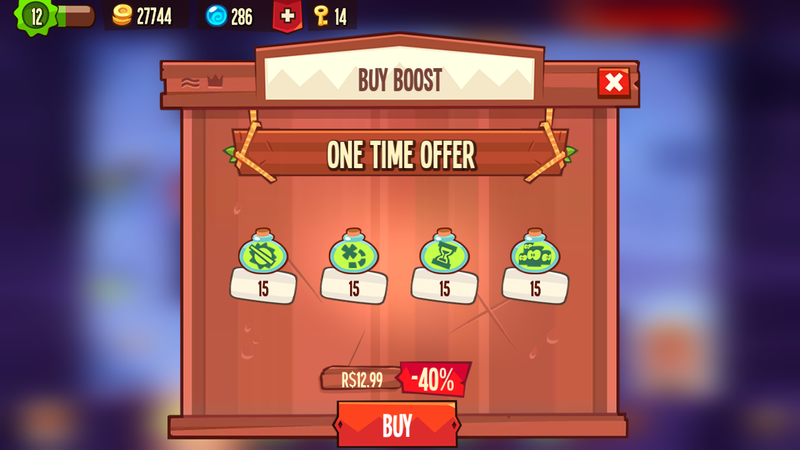 This post is about a F2P game that made me spend money, made me quit playing it and then giving me a nice surprise while writing this. It all started around Feb/March 2015, when everybody in the company started playing King of Thieves. I download the game for my iPad and played all weekend long. We created a clan and played almost every lunch/break. I liked even more than Clash of Clans, because of the action and skills involved. It was really nice and fun. And then started being a little bit competitive… And some of us bought some things in the game to stay on the competition. I switched from iOS to Android after that fateful weekend because I still had some money in my Google Wallet. To my surprise, the game didn’t sync my progress between devices using my Facebook account. At the moment I thought it was weird, because the game surely had a server to save all the data from player’s dungeon, but I haven’t played much and it was ok for me to restart the game. (I should have known better…). A few weeks later and precisely one day after I made the purchase, my phone was stolen. I got a new one later and downloaded the game again. I had to play all the tutorial again, because there wasn’t an option to connect to Facebook right away. Then, when I finished the tutorial, I tried to find where to connect and the game didn’t sync, I couldn’t find easily a place to restore my purchases or to contact the developers. I was so disappointed with the progress and the money I had lost, that I uninstalled the game. I wouldn’t start all over again. Today, when I downloaded the game for the third time to get some screnshots to write this post, I had an amazing surprise when the game syncronized correctly. And with my purchases! I don’t know if it was a bug that they fixed months later or if I was just unlucky, but just because they let me down, doesn’t mean that I think their monetization is bad. On the contrary, it made me buy stuff that I normally don’t buy, so let’s talk about that. It’s a fast-paced one-button plataformer (one-tap? 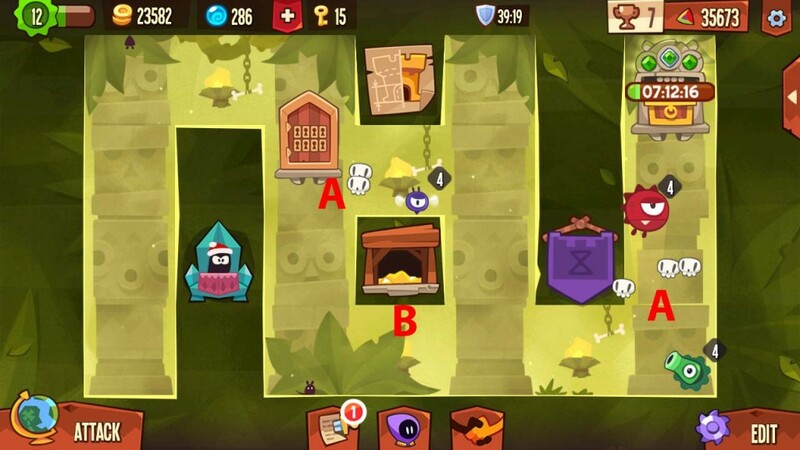 you got the idea), where you need to go from point A to point B to steal loot from the dungeon and become the King of Thieves. It has a high chance of death, but low replay friction and all the suporting systems worthy of a new Clash of Clans. One of the reasons I think this game have a nice monetization is because it is smoothly tied to its action loop. 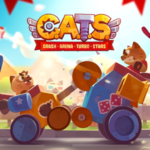 Pay attention that the more engaged the player is, the more are the monetization opportunities. The first thing you do when you enter your dungeon is collect the rewards you have gained over time. A . Collect from dead bodies: the other players that tried to loot your dungeon leave a small quantity of currency behind. Although it doesn’t have a fixed time it happens frequently. B. 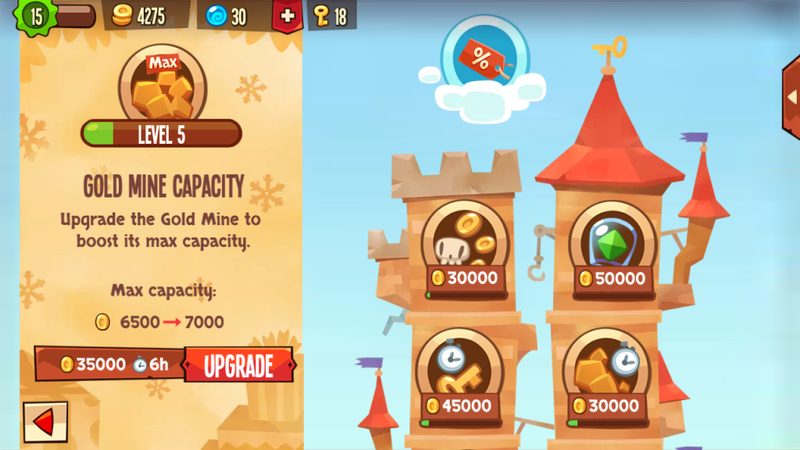 Collect from your gold mine: it generates currency over time with a max capacity, that can be improved by upgrades. The catch is that you don’t need to to wait until it is full to collect, so it turns to be a short timer. C. Collect gems: mid-long timer to make you want to go back to the game. This part of the loop have an indirect relationship with the monetization (the more you have spent on defenses and upgrades, the better are the rewards). But this isn’t clear to the player, instead, you just get a bunch of rewards just for returning to the game, and that fells nice. The player can loot dungeons from other players (PVP) or from the world’s levels (PVE). So, no matter if you are a PVP-only kind of person, you need to do the PVE to progress (Totems break after performing a quantity of rituals) and on the other hand, if you like only PVE, the rewards from PVP are really good if you want to be competitive in the leagues (I’ll cover that later) and a way to continue playing fresh content, once you finished all the levels. Enter Dungeon: Here we have a clever key system that randomizes the use of energy. 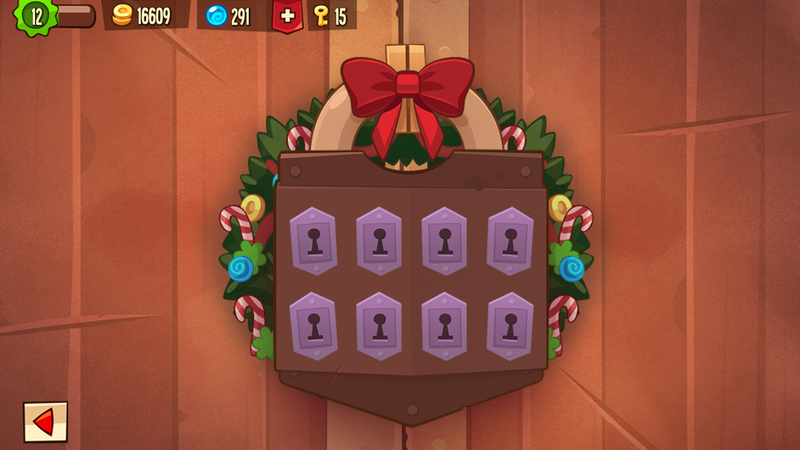 Instead of just spending 1 key to enter the level, you have 3 (or more) keyholes were you can spend a key and try enter. 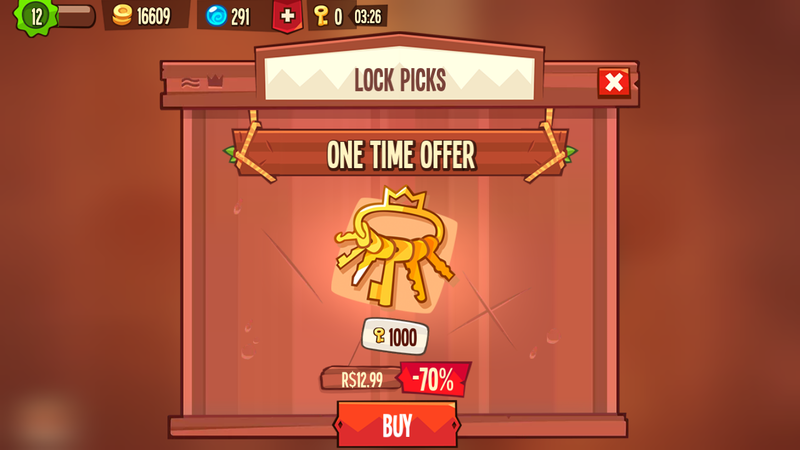 If you run out of keys, you can either buy a Key Refill or watch an Ad to get a small quantity of keys (which is great for the players that won’t spend anything on the game). Raid: Play the level. 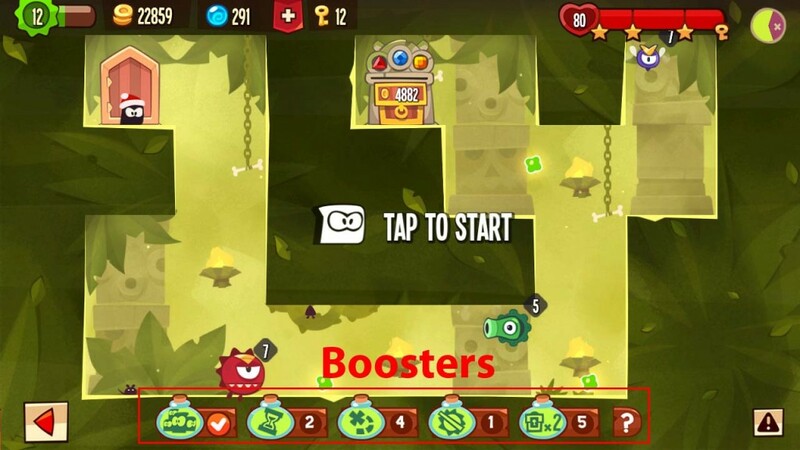 You gain more rewards if you have more life when you finish the level. You can upgrade you character to take more damage before losing a star. This can’t be done while playing, just inside your dungeon. But, you can buy power ups during the raid step to help you on difficult levels. You get boosters after performing rituals. 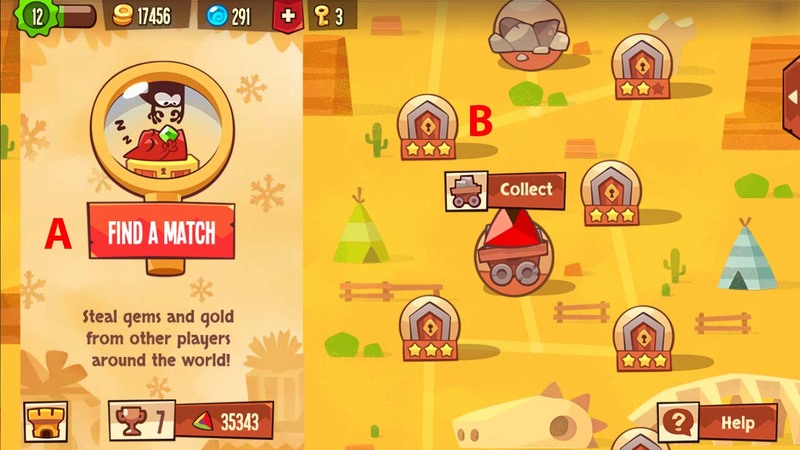 Loot: Besides the soft currency loot, if the opponent has a gem on his/her totem, you have a chance of stealing it, based on your how much life you finished the level + the bonus from your dungeon upgrades. 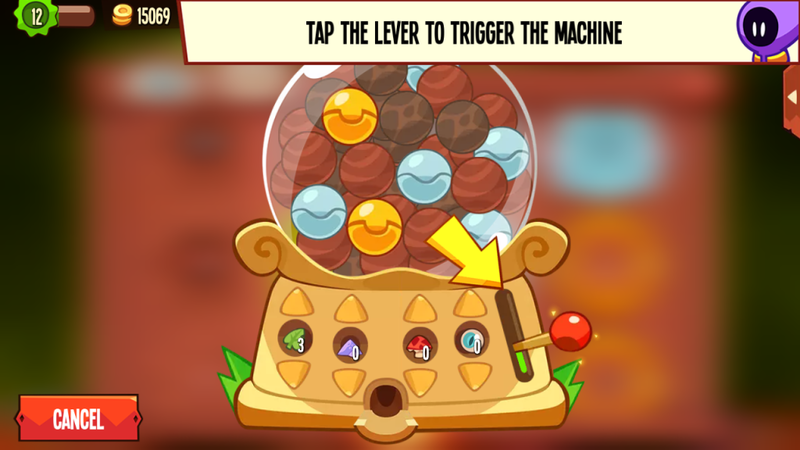 If you don’t get the jewel on your first free spin, you have a chance to respin it using HC. It is a great placement, especially if you spent a lot of keys and boosters on the run. Also, each spin costs more that the last one, giving the sense you will lose your investment if you don’t play until you win (this part I thought it was a little bit evil…). Some players won’t spend money on keys, others will be thrilling to play more levels. 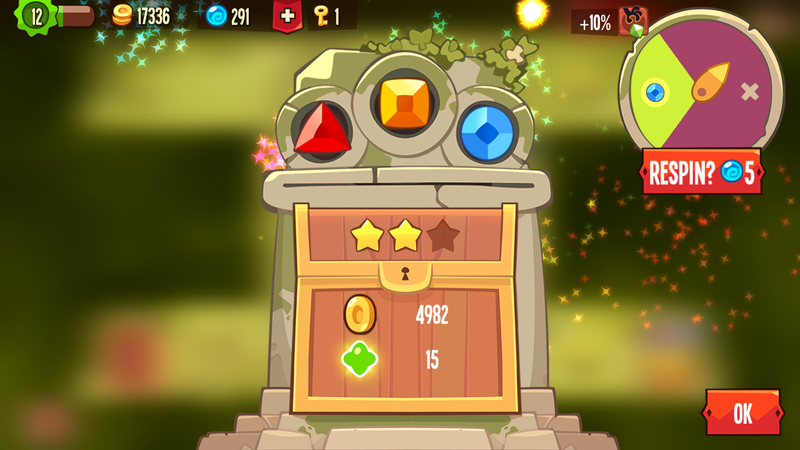 Some will want to win back their gems, no matter the cost, others will just want the satisfaction of beating the level. 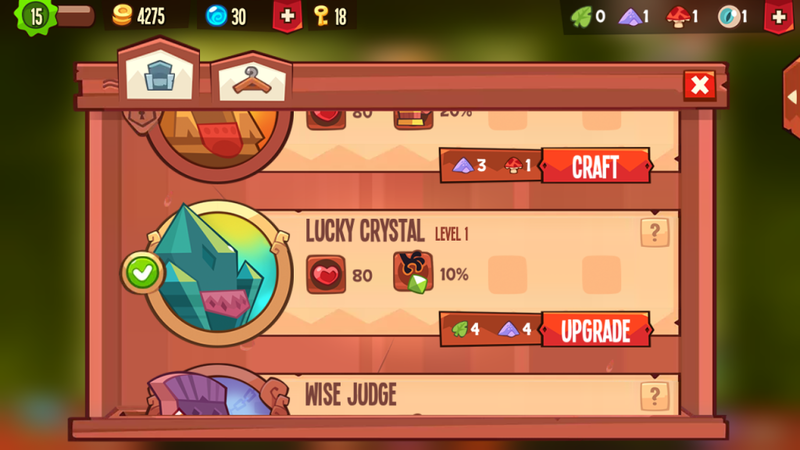 So, if you can get gems from other players and from your gem production, why would you risk your gems performing rituals? To improve your league rating of course. 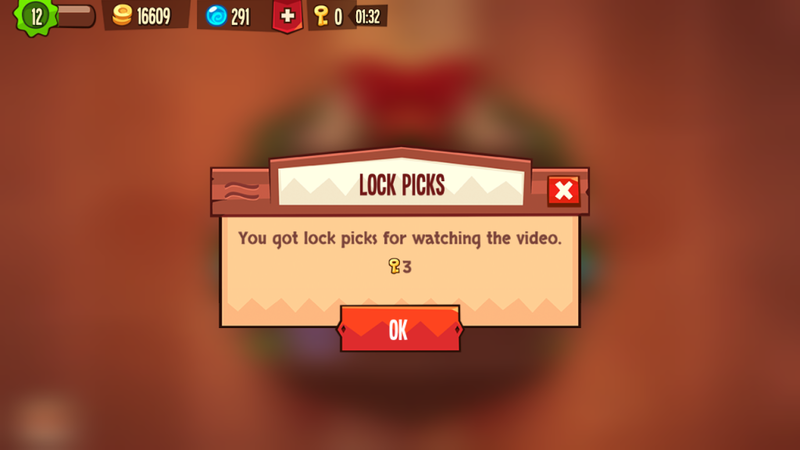 In King of Thieves, you participate in leagues (there isn’t any opt-out). Top three players on the league gets Soft and Hard Currency rewards, and by the end of the week are promoted to the next league. There is a major social pressure to participate in those, especially if you are in a clan with friends. The Ritual process is simple: You put 3 gems on the totem and leave it there, after some time, they merge into one of higher value. 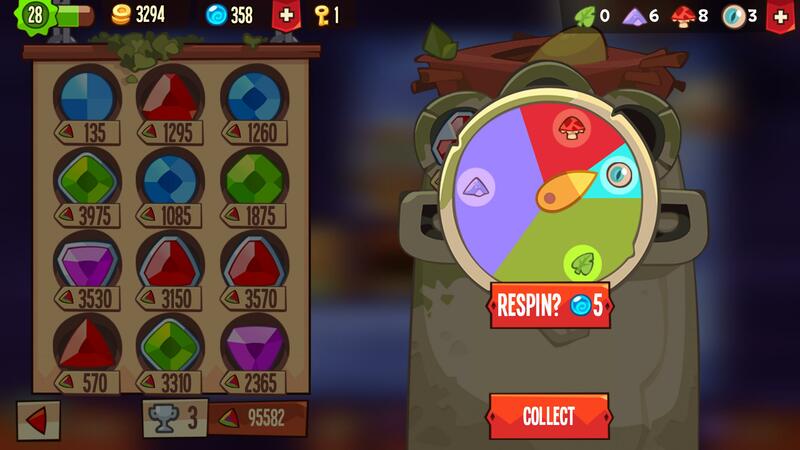 All gems are stored on slots on the left side of the screen. 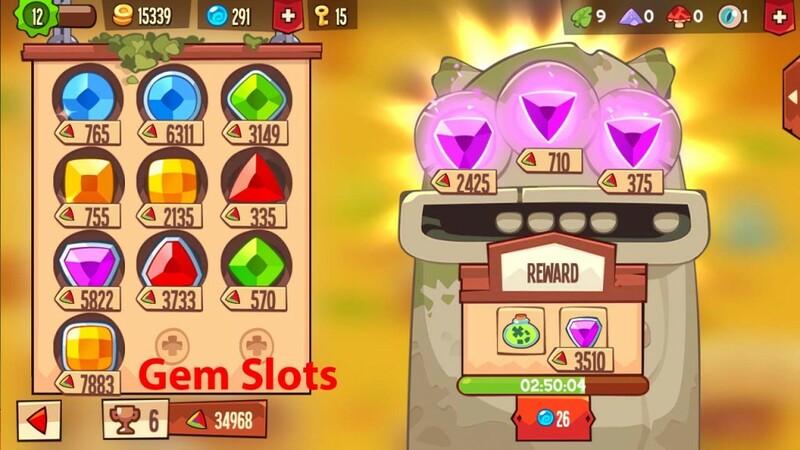 If you collect more gems than slots, the highest gem goes to a slot and the lowest is transformed in SC. You can buy more slots with HC to maximize your rating. 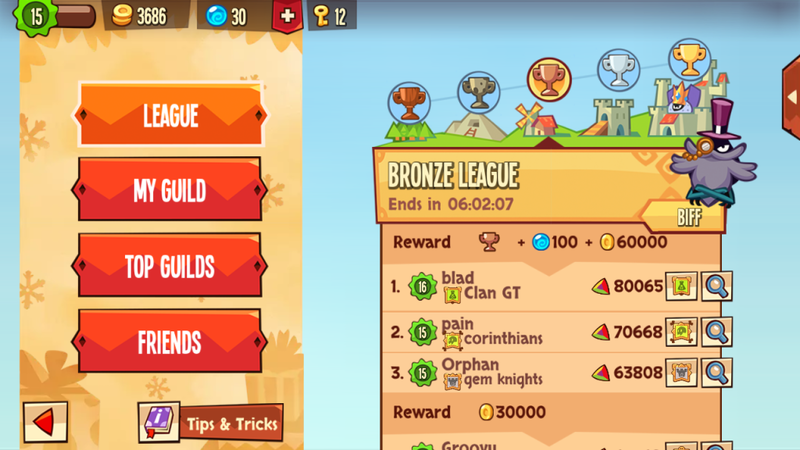 Rituals takes more time the higher the gem’s value, and there is the constant risk of other players stealing your gems. That’s why there is an option to haste the ritual time, finishing it immediatly. It is even taught on the tutorial. Once you collected all the possible rewards you could from a session, it’s time to upgrade your defenses and attack power. All of the improvements above require soft currency and time to be completed, that can be hasted. When starting a new dungeon, you can pick a defense system that can be low but free, a medium SC cost or a high HC cost. 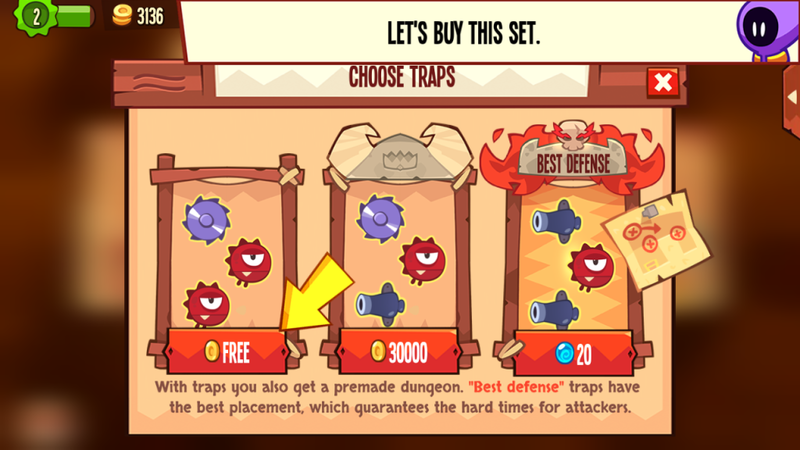 While the lowest defense doesn’t mean that you will have a bad dungeon layout, higher defenses help a lot people that can’t design a good dungeon. After you set you defense, you can upgrade each of the elements for SC. These upgrades also take time and can be hasted. 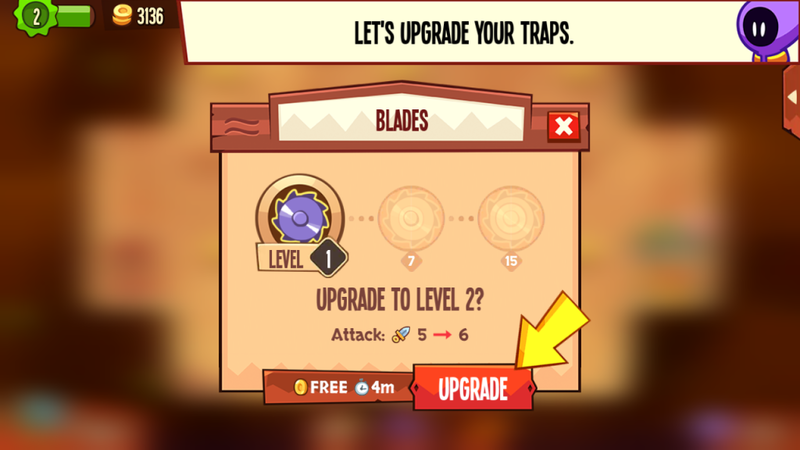 The haste here is really atractive, because while the element is upgrading, it is inactive, leaving your dungeon more vunerable to successful attacks. That part has changed a lot since the first time I’ve played. 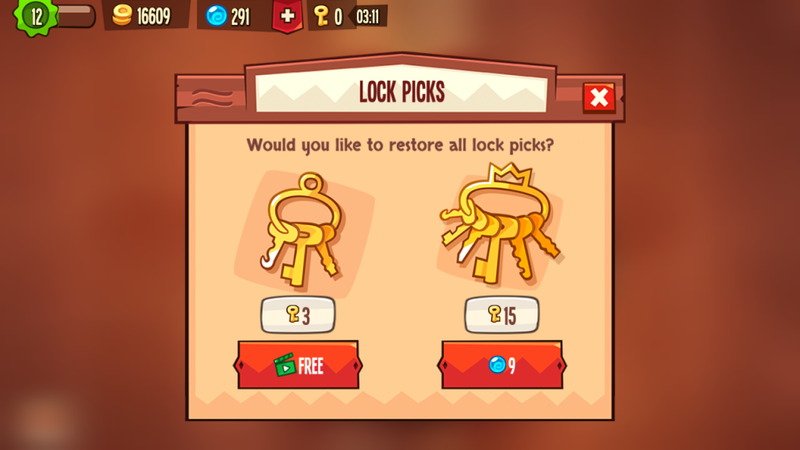 Right after launch, you used the materials to buy new clothes with gameplay benefits: higher life, higher chance to steal gems, etc. What I liked is that the best suit (the white shadow) was featured in the tutorial, stealing your first gem. You could see the power of the outfit right on the first minutes of gameplay. This has been changed to the Thrones, giving the same functionality. The character now has a lot more options, and you can get new outfits using a gacha system that drains your materials for rewards. 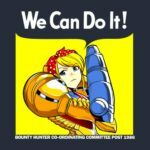 The more and materials you use, higher are the chances of getting a rare character. They don’t have any more functionality, they are just collectibles now. That fact made me think it lost a little bit of the point. But maybe they saw people with a lot of extra materials (for hasting rituals or buying material packs), and they wanted to drain that somehow. 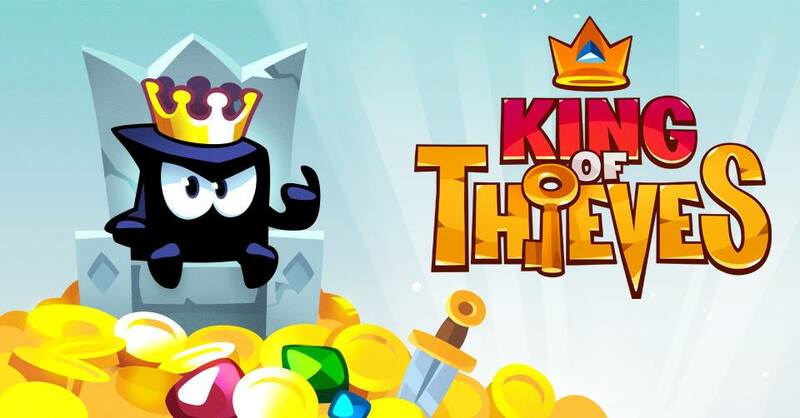 With a mix of different and creative techniques, King of Thieves is a fun game to play and to spend. Although there are a lot of points they monetize, it wasn’t intrusive at first sight. 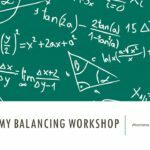 They distribute HC with frequency and teaches you to spend it, little by little, including in the tutorial. I would recommend as a game to play and as a F2P source of inspiration.